Dina 3 must be one Germany's busiest bands. Every few months, this alternative pop three-piece releases a new EP which may be ordered for a very low sale price on the band's homepage. During 2003, they have been touring as a support for bands like Die Sterne or Erdmöbel. 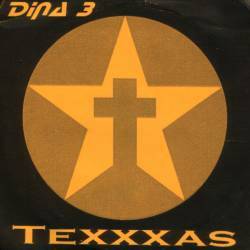 People who appreciate the aforementioned bands won't have too many problems to get familiar with the sound of Dina 3. On songs like Heute TeXXXas – morgen die Welt, Süddeutschland and a few more, they also play a kind of diskurs pop where noisy and melodic parts appear in the right combination. Two songs (Expo Plaza No. 1, Kotzgesicht) are much more melodic, and music as well as lyrics remind me very much of Die Ärzte. Furthermore, and I have to mention this in every Dina 3 review, all songs are taking advantage from excellent pop vocals which can be compared to Farin Urlaub or Johnny Bottrop. The lo-fi production will perhaps not be to everyone's taste, but it's all right. The only negative aspect is that two songs are cut at the end in a very radical way without a fade out. Apart from that, TeXXXas is another Dina 3 EP worth listening to.